High-quality and Tough Eibach's legendary spring system, the Pro Kit, dramatically improves the performance, handling and appearance of your vehicle. The secret is Eibach's proprietary progressive spring design, lowering your vehicle 1" to 1½" without compromising safety or ride quality. And, the advanced cornering takes your passion for driving to a whole new level. 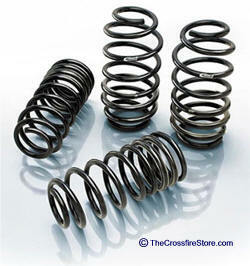 Dropping your vehicle with Eibach Pro-Kit Lowering Springs makes a world of difference for your vehicle. These Eibach Springs lower your vehicle's center of gravity, reducing acceleration squat, cornering body roll and braking nose dive. Plus, the slight drop eliminates fender-well clearance for first-place racing looks. Installing the Eibach Pro Kit takes more than a few hours to complete safely and correctly. You'll need several tools, most likely including a spring compressor. The added performance and looks are well worth the project time. 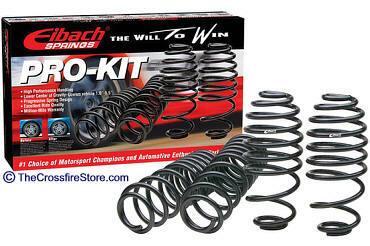 Best yet, your Eibach Pro-Kit Lowering Springs carry a Million-Mile warranty. Note: Initial lowering length may be less than 1". Your vehicle will settle shortly into the 1" to 1½" lowered range. Exact length depends on the weight of vehicle components. Let your suspension live up to its full, tire-squealing potential with new KONI Sport Yellow Shocks & Struts. Fully-adjustable, your KONI Sport Yellows are designed to give your ride precision handling with a practical amount of comfort. 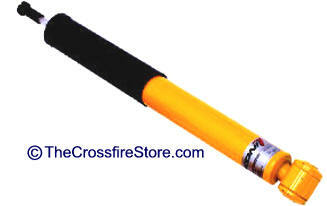 Not to mention, a clean, bright yellow look that’s guaranteed to turn heads. Created for sport-tuned driving, KONI custom builds Sport Yellow shocks & struts with high-performance damping and valving specific to your road racer. User-friendly KONl Sport Shocks are easily adjusted for maximizing performance on-the-go. KONI Sport Yellow Shocks & Struts are the ultimate upgrade to your stock suspension system – allowing you to take twists and turns faster and tighter with extreme control. 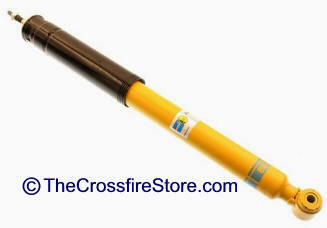 Your KONI Sport Yellow Shocks & Struts carry a Lifetime Warranty. Take control of your ride quality with powerful Bilstein Heavy Duty Shocks & Struts. The ideal, everyday performance shock for full-size vehicles, Bilstein B6 HDs are designed for daily-driving, heavy hauling and occasional off-road action. Gain a competent grip on the road ahead with these sturdy aftermarket shocks & struts. The seamless mono-tube design provides long-lasting strength and allows for instant adjustment from smooth highway cruising to rigid off-road adventure and anywhere in between. Not only do Bilstein HDs upgrade your suspension performance, but they deliver an all-around improvement in how your full-size car, truck or SUV rides. Get unbelievable gains in control and precision handling, while you maintain cabin comfort.